LONGMONT, Colo. – Some patients at UCHealth Longs Peak Hospital in Longmont now have a new view, thanks to a local business. 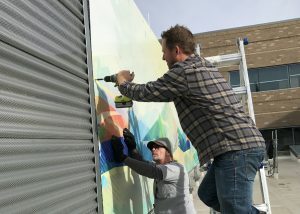 The Longs Peak Hospital Foundation recently teamed up with Longmont art manufacturer DuraPlaq to design, create and install rooftop artwork to offer a colorful, mountain inspired aesthetic for the patients and staff. A team from DuraPlaq installs one of the 55 art panels that now cover the rooftop air handlers at UCHealth Longs Peak Hospital in Longmont. Photo by UCHealth. Top photo courtesy of DuraPlaq. The 55 art panels, which cover the hospitals’ rooftop air handlers on the north side of the building, depict a sun-drenching rendition of the Rockies with winding streams and country roads leading through mountain passes, according to Andrew Deschenes, a manager at DuraPlaq. “We hope it will provide a sense of comfort and tranquility to all who see it,” Deschenes added. Longs Peak, located at 1750 E. Ken Pratt Blvd., opened in August 2017. The 51-bed full-service hospital features an intensive care unit, four operating rooms, a Level III trauma center and emergency department, a birth center with a Level II special care nursery, a café, a gift shop, and a courtyard. The rooftop art project, visible from the north-facing patient rooms, was made possible by the generosity of private donors.